This sweet, heirloom variety has a deeper and more interesting flavor than the standard flat leaf spinach. Each leaf is heavily crinkled, giving it a heartier texture. Late fall, winter and early spring. Bloomsdale does not do well with heat and easily bolts. Can be used in salads, appetizers, soups and braises. The small, more tender leaves are great sautéed or wilted with a little olive oil and garlic. The stem is edible and super sweet since the plant's sugar is stored there. 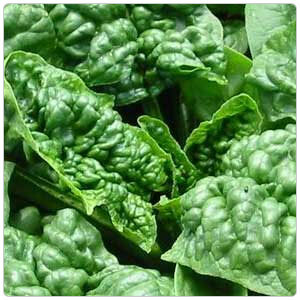 Bloomsdale is an old variety of spinach, introduced in the 19th century by David Ladreth, who named the greens in honor of his Bristol, Pennsylvania, farm.